Sakai Guides and DocumentationFaculty Guide Creating Accessible ContentHow can I make images more accessible? Users with some disabilities will be unable to see images and/or comprehend what they are meant to convey. Alternative Text can help give context and meaning to an image. Simple image with "simple meaning" - add descriptive alternative text of 10 to 169 character as outlined below. The alternative text should describe the educational/informational purpose of the image. Complex image with "rich meaning" - add a paragraph above or below the image that goes into more detail. Some pointers, such as "Next image," or "Previous image," will help tie them together. If the image is referenced from elsewhere in the document, add a paragraph below it that can serve as a caption, and then refer to it. If the longer alternative text is not feasible, create a link to an external Web page that contains an appropriate description. Decorative image - if the image is purely decorative or used for visual formatting, the alternative text description should be left blank to hide it from users of assistive technology. If you do not already have an image embedded in the text box, click on the Image icon in the Rich-Text Editor's toolbar to insert an image. The Image icon displays a picture that looks like a landscape, with mountains and a sun. 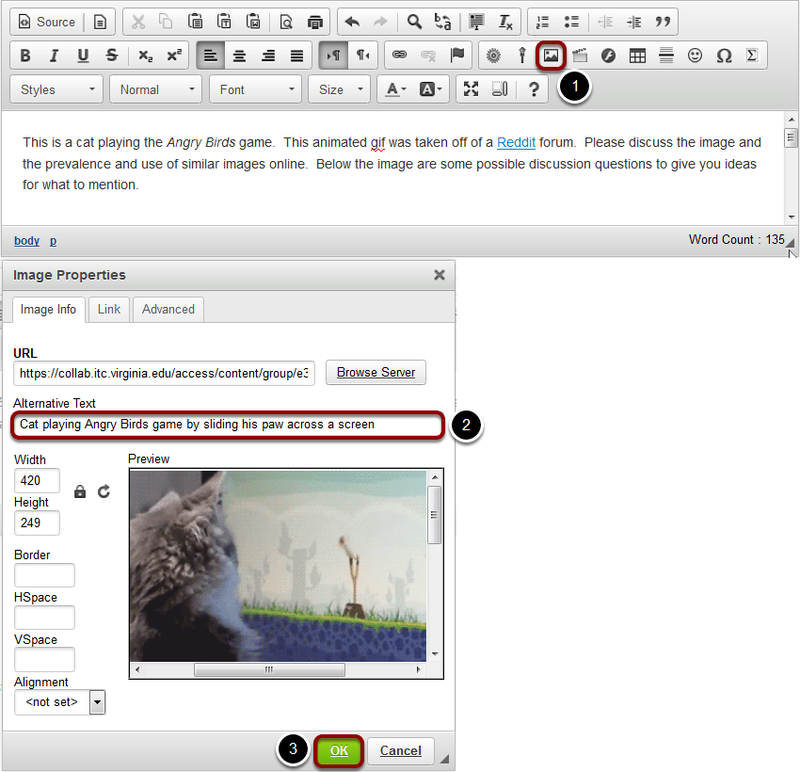 For more information on adding an image, please see the article How do I embed an image in a text box? 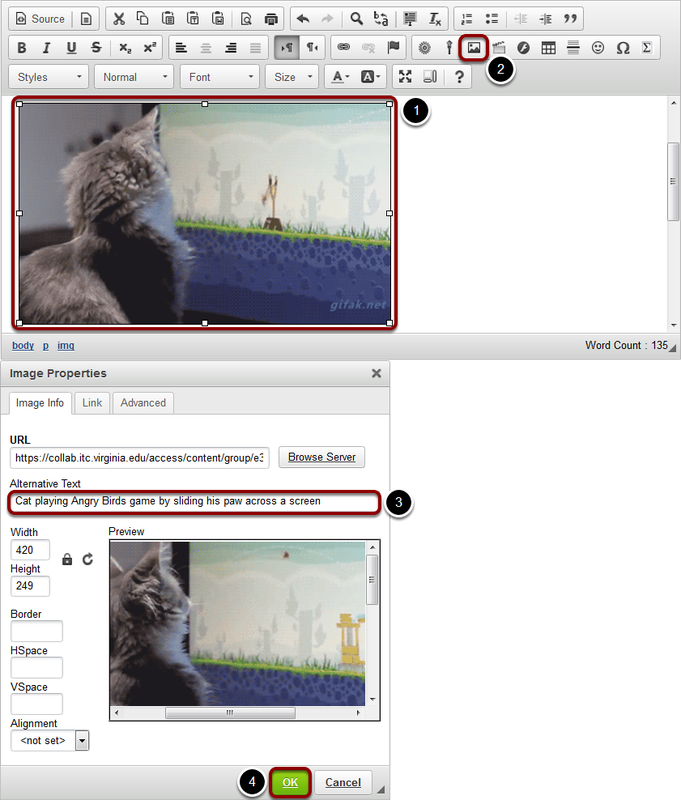 In the Image Properties dialog window, enter short, meaningful descriptive text in the Alternative Text box. Click OK to confirm the addition of the text. Click on the image you have embedded in the text box to select it. Click on the Image icon in the Rich-Text Editor's toolbar. The Image icon displays a picture that looks like a landscape, with mountains and a sun. Prev: What are some guidelines for making content accessible? Next: How can I make tables more accessible?